Tired of dealing with the weak factory rear end in your fifth-gen Camaro? Check out Strange Engineering’s all-new S60 bolt in housing, which brings Dana 60 strength with OE type fit and finish. Cast from aluminum, the S60 IRS rear features reinforced billet main caps, the tried-and-true S-Trac differential, a 1350-sytle driveshaft yoke, and your choice of ring and pinion. 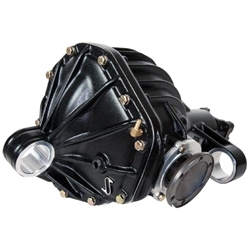 An O-ring equipped rear cover ensures a leak free seal, and the cast housing accepts OE and aftermarket bushings for a stout mounting solution. Bolt on our, fill it with fluid, and your ready to go. Strange Engineering designed the S-60 rear to bolt up to Gforce Engineering OEM replacement axles or Gforce 9″ axles. If you dont have either set of axles currently then you will need to add axles. Gforce Engineering helped Strange Engineering test the S-60 out in a 9 second 2010 Camaro. We were the first to install the S-60 and the first to road test and track test for development. Our test car has been on the road putting thousands of miles on the test unit with zero problems, it drives nice and quite and can take the abuse of 1,000+ rwhp day in and day out.